Sometimes, you aren't supposed to see or notice things. Sometimes, you are supposed to overlook what you see and ignore it. Sometimes, you are supposed to just keep on walking as if there is nothing out of the ordinary around you. tell her to shove it! "Really. Do I look like I'm posing for photos? and move to the North Pole, or something, eh?" i almost didn't see that kitty!!! how cute! Awww...did you take her home? Nice captions! It took me a while to find the little cuitie, and I think the eyes are telling: take me along! Love the black cat and the captions were cute. It took me a little while to figure out where the little cutie was hiding in the picture. looks like a skunk to me! Gads, I need new glasses! NOW I see the cat! What a darling little Kitty! LOL I'm sure thats what this cat was thinking :) Cute post. I just got to your SWF post too. I love to shoot farm and their equipment too. This is a great shot. Oh my... what a cutie hiding out in there!! 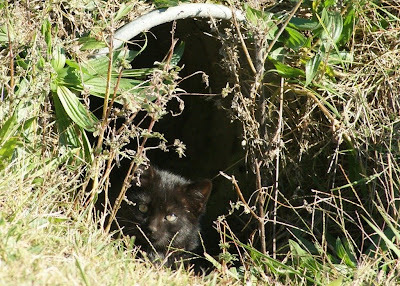 Misty: A giant Black Panther in that cave, amazing. Ha, a very good observation ! and I have to admit : the "farm equipment" looks very good with that big blue sky. Hahahahaha...I bet that cat wanted to shove that camera itself! Wasn't sure what I was looking at in the first picture, but found out as I read on...have to say that kitty looks to be in control of things :-) Thanks for stopping by Spatter..
Awww... what a cute kitty! I almost didn't see it at first. I love your captions... Lol! Alwaya cute words and even cuter inages. What a great hiding spot. Didn't catch her at first. WOnderful shots. Those eyes they say it all..he/she might be a domestic kitty but those ole big cat instincts are kicken in.. be cautious..wait and see. 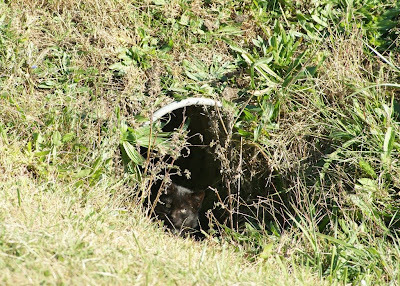 Nothing like a cat peeking out of the weeds, tho, to set the dogs off! lol my dog would have done the same!! Good post Misty, enjoyed it a lot! He's keeping an eye on you! Mine is up at my other blog. yes! I agree with them, she's cute and adorable. Thanks for sharing.. Seeing the Unseen is what Like in Life the Best. It took me a minute! She's hiding from you! Awww! Misty won't hurt you kitty! She loves animals!!! That kitty doesn't look too pleased to be having its photo taken. I've got some cheeky squirrels for Camera Critters this week.